Does anyone have an assembly guide / tool descriptions for reassembly of the big end? Specifically pressing / pulling the crank back on the duel set of ball bearings? cfaber wrote: Does anyone have an assembly guide / tool descriptions for reassembly of the big end? Specifically pressing / pulling the crank back on the duel set of ball bearings? The two new ball races were placed on a baking tray and put into the oven at 200°C. 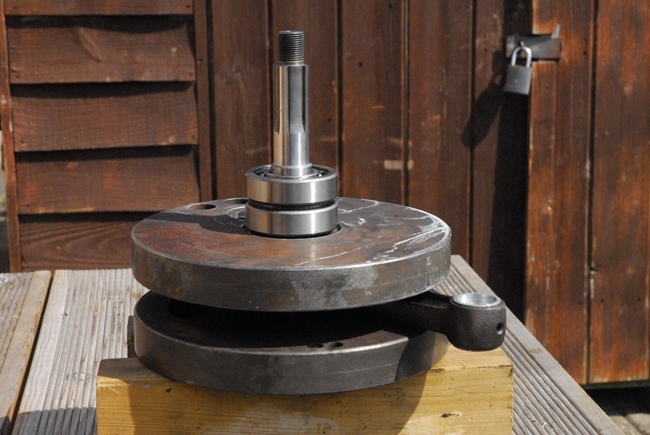 The crankshaft was supported on wooden blocks on the table outside. The first hot ball race was dropped over the drive side axle and down to the locating shoulder. The washer and spacer that go between the two bearings were dropped on next, followed by the second hot bearing. No persuasion needed, they just dropped into position easily. The drive side half of the crankcase was heated in the oven to 200°C, the bearings on the crankshaft had cooled down so it was simply a case of dropping the crankcase half over the bearings. It dropped on with a satisfying 'ding' and that was that... drive side main bearings installed. No bashing, banging or pulling required. Should the bearings need to be heated to drop onto crankshaft? There are different grades of fit for bearings and I would have thought the bearings that need heating to fit to the crankshaft are too tight. The crankshaft should be a sliding fit in the bearings, at least all the bottom ends I have worked with are like that. If you have to heat the bearings to fit them presumably you are going to have to heat the the flywheels, conrod, crankshafts and one half of the crankcase to remove it. In my experience you need to heat the crankcases to fit both bearings and before sliding the crankshaft into the bearings ensure that the washers between the bearings are properly lined up. clive wrote: In my experience you need to heat the crankcases to fit both bearings and before sliding the crankshaft into the bearings ensure that the washers between the bearings are properly lined up. That's how I've always done it too, also. Heat the crankcase til it spits back when you spit on it. And for afterwards, cook a rice pud on the top shelf. clive wrote: Should the bearings need to be heated to drop onto crankshaft? There are different grades of fit for bearings and I would have thought the bearings that need heating to fit to the crankshaft are too tight. The crankshaft should be a sliding fit in the bearings, at least all the bottom ends I have worked with are like that. If you have to heat the bearings to fit them presumably you are going to have to heat the the flywheels, conrod, crankshafts and one half of the crankcase to remove it. It was a brand drive side axle (from Andrew Engineering) and brand new bearings (from the club spares). They were not a 'slide' fit. I could probably installed them by putting a length of pipe over the axle and tapping them on with a hammer, but I prefer to warm them up and install them without the need for brutality. That's exactly why I installed the bearings onto the drive side axle first. All the components are lined up correctly for installing into the crankcase half. Each to his own, eh, John? 'Twould be a boring old life if everyone put the jam on their scones before the cream, but Hey! either way it tastes the same. 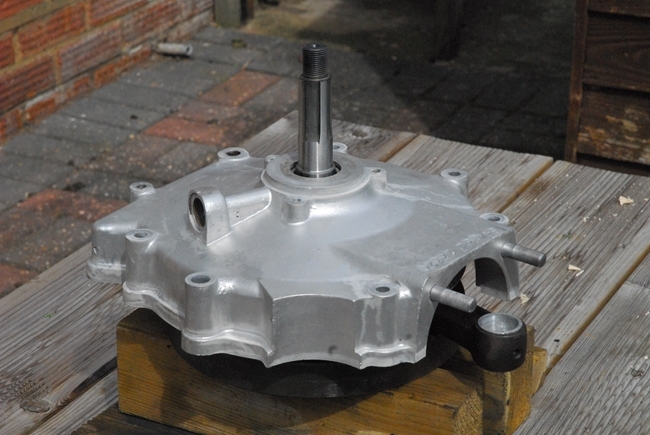 Crankcase in't th'oven, bearings in't freezer. Mind your fingers and always use oven gloves. I think I might have tried polishing the new driveside axle to get a sliding fit. If you have to disassemble the crankcase how are you intending to get it apart except by heating the whole thing up?